In October 2008, Caris Foundation International, a Texas private non-profit launched its services in Malindi, Kenya. Its aim, to make a difference in the lives of impoverished people through aid and empowerment. Sixty of the most desperate mothers and their 105 children were selected and enrolled into the Single Mothers Program (SMP). Ten years later, Caris Kenya has expanded its area of work to five sub-locations, and 1954 women participants in the Tuajalie Tujisaidie Groups (TTG). Learn all about that and the other work being accomplished there in these recent newsletters that are produced entirely by our Kenyan staff. Click on the newsletters below to open up the PDF. 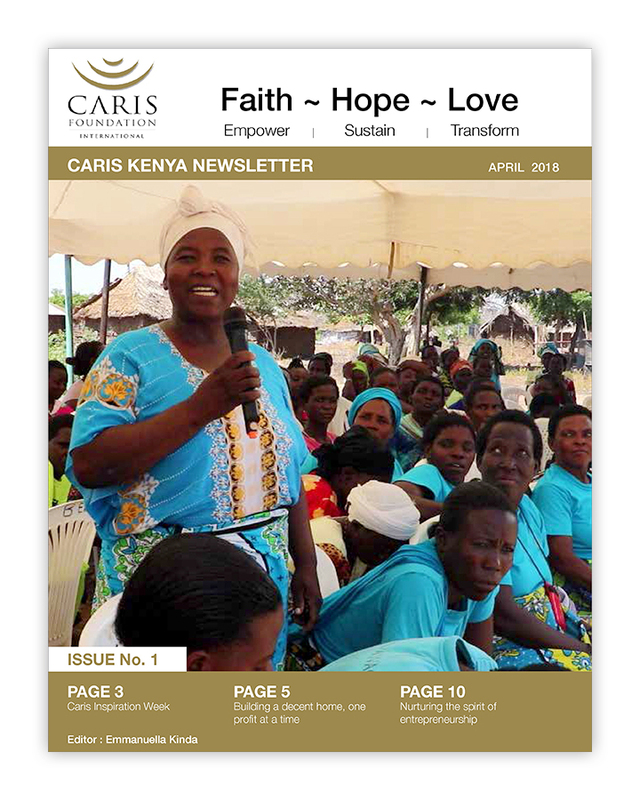 FAITH, HOPE, LOVE are the spiritual pillars of Caris Foundation Kenya. We believe that to empower people out of poverty it takes Faith, Hope and Love. Faith to believe in the possibility of a better life beyond poverty. If a person is to get out of poverty and remain out of poverty they have to have FAITH that it can actually happen. They must BELIEVE that God has given them the potential to improve their lives. And they must BELIEVE in themselves to act upon that truth to see it happen. HOPE is putting that Faith into action. Hope is planting a cash crop and planning on paying for your child’s eduction with the profit. And that is exactly what some of our women did. They planted in FAITH and planned with HOPE and harvested a profit. LOVE is the nurturing environment in which people can grow making their potential a real success. LOVE gives a person value and acceptance without which initiative and desire to improve wither like grass in the hot sun. Without FAITH, HOPE and LOVE poverty remains. As you read through this newsletter you will hear the stories of our ladies who have been empowered out of poverty by this approach. 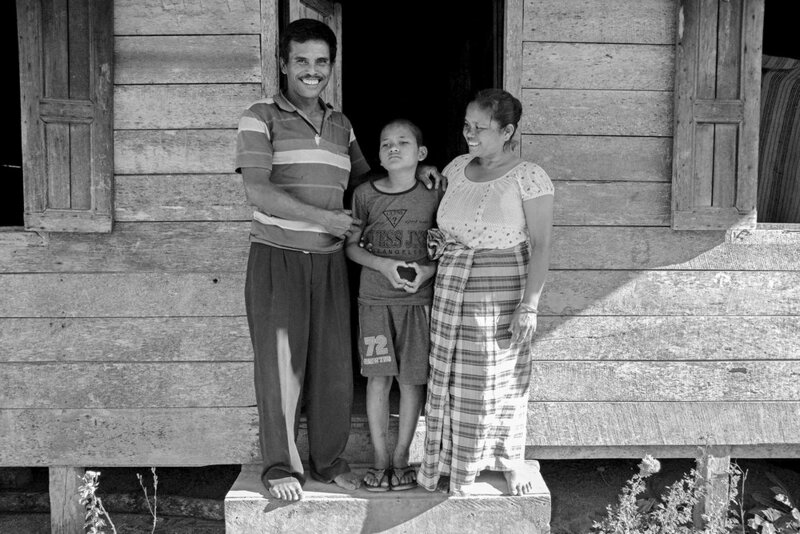 These are stories where Faith, Hope and Love conquered poverty. Women who could not read and write can now read and write. Women who never thought they would be successful business women are now successful. Women who never thought they would live in a better house are now able to invest and build their homes. Poverty is conquered with Faith that life can change, and Hope to carry on till success is sustainable with caring Love. And that is what we do at Caris Kenya. We empower people with Faith, Hope and Love to give people roads out of poverty. And may they never return to poverty again! Qualified and interested firms may obtain an electronic copy of the Invitation for Bids (“IFB”), including terms, conditions, and specifications by making written request to Christopher Harmon at the above address or by email to christopher.harmon@carisfoundation.org. Telephone requests will not be honored. CFI invites bidders to submit sealed bids for the supply of project vehicles and related goods/services as further described in the IFB. Bidders must demonstrate capability, based upon technical expertise, management capability, workload capacity and financial resources to implement and manage this contract. It is CFI’s intent to award a contract to the lowest responsive and responsible bidder. The anticipated implementation period is April 2018, starting from the official start date of the contract. CFI encourages and welcome in this activity the participation, to the fullest extent possible, of minorities and women both as individuals and as members of contracting or sub-contracting firms. In this respect, it is anticipated that the prime contractor will make every practicable use of such personnel and firms. The participation of small, disadvantaged and women-owned business concerns in this activity as prime contractors or subcontractors are encouraged if they meet the above stated requirements. Bidders making offers to provide the vehicles must be eligible suppliers in accordance with the requirements set forth in 22 CFR 228 of the U.S. Code of Federal Regulations. Bidders must also comply with the applicable provisions of 2 CFR Part 200. About 500 gathered to celebrate as we graduated 338 of our older participants on the 9th of June, 2017. What a day of celebration and joy! Shosho Margaret opened with the devotional. Then lots of music and dancing. Testimonies from our role model ladies. Certificates given to our tailors and hairdressers. A hilarious but poignant drama that continued the story of Edna (Edward) the Caris participant who now leads her own groups. Jane Gitahi, Kenya Program Director, and I commissioned them to be change agents in their communities. The theme was – "SHINE! You have changed through the teaching and training you have received in Caris and you are shining. So now shine on others the knowledge and training you have received." To symbolize this we gave them each a set of plates, cups and serving tray and encouraged them to invite friends and neighbors for tea and share with them the better way of living they are now practicing. They were commissioned with a sash over their shoulders that read "Graduation 2017 - Caris Foundation - Grace to All". So a continuous line of all 338 women came singing and dancing to receive their graduation gift and sash. Then we had a graduation cake cutting ceremony and sharing of small pieces with everybody. A closing prayer by Daniel Chengo warmed all our hearts. And finally we had a delicious meal together with plenty of food for all. Kathy and David D. Halbert, founders of Caris Foundation, have made a generous donation through the Foundation, to fund the Halbert-Walling Research Center on the campus of Abilene Christian University. The Halberts represent a four-generation family with deep ties to ACU. The 54,000-square-foot facility opened for classes in January 2017 and serves as the new home for the departments of biology, chemistry and biochemistry and the Body and Soul program for pre-health students. Its laboratories, classrooms and lecture hall boast state-of-the-art equipment and modern designs. A display in the building highlights the impact that Caris Foundation is making around the world (Click on image to enlarge). 2,000 women gathered to celebrate the end of another year of empowerment. They came by the bus loads from their villages and homes. They came singing with excitement of seeing new colleagues bonded together in their quest for sustainable income, food security, healthy living, and peaceful hearts. They meet together in small groups every week, encouraging one another, giving to their savings and loan program, and discussing solutions to their own issues. But now 2,000 of them came together to share with glee the success and discoveries of a new way of living. Above the harmony of constant chatter was music offering a festive atmosphere for women who normally have little or no occasion to celebrate. So the program was punctuated with dance and song – hands in the air and ululation of joy. A day of celebration and eating together. It’s time to celebrate! It’s time to share life! It’s time to be community! Community Empowerment! INDONESIAN SURGERY CAMP: 509 EYES NOW SEE! 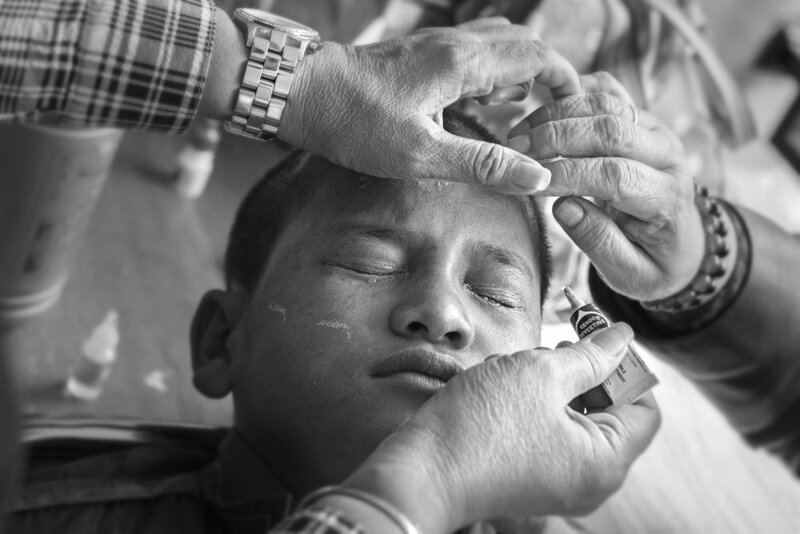 The patients at our biannual eye surgery camps in Indonesia usually cover the gamut, from young to the very old, though typically we don’t see many children. 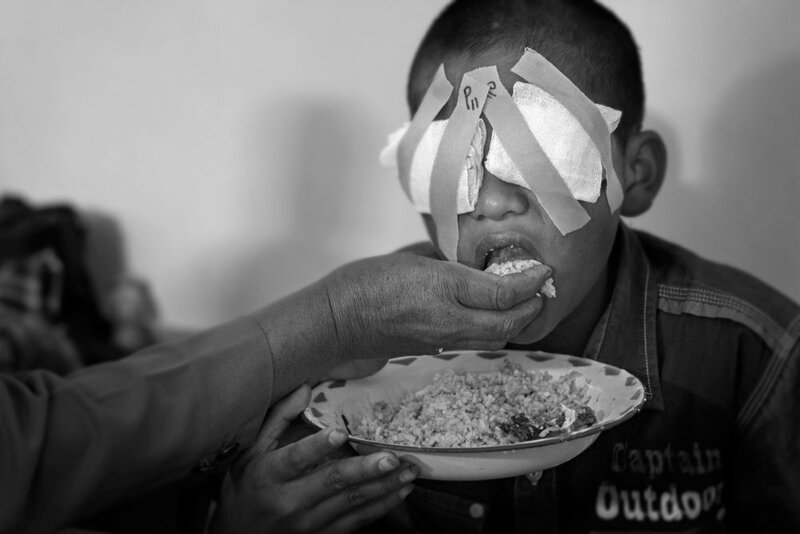 This year, however, the doctors operated on two, Lamhot, age 11 and Elfrianti, age 12, in Sidikalang in Northern Sumatra. 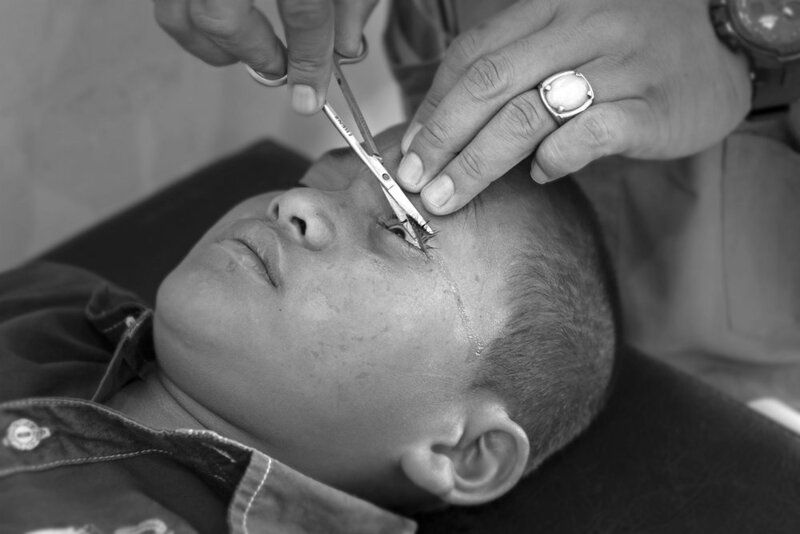 They each had two cataracts and due to rapid deterioration there was a good chance they would be blind within a year. These kids were very brave souls to go through these operations at such a young age. Here’s a short video of their story. 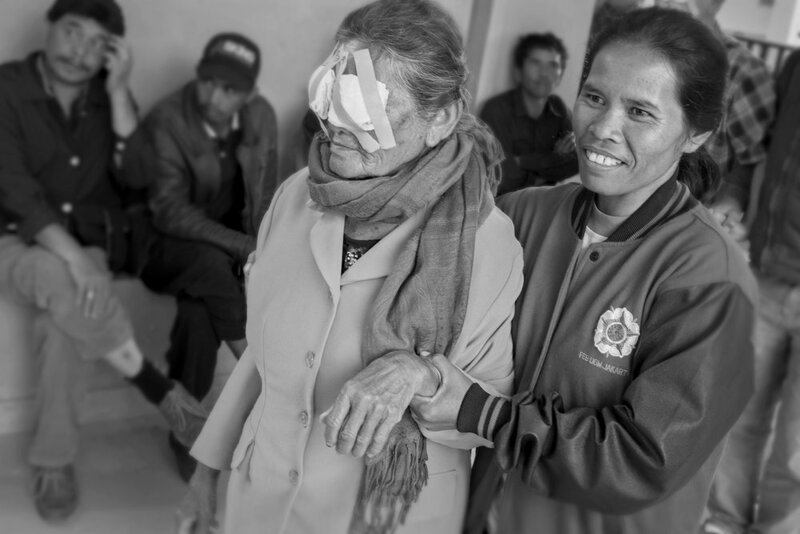 This March, Caris Foundation in partnership with Body and Soul Ministries was able to complete cataract removal surgery on 509 eyes in three locations in Northern Sumatra, Indonesia. 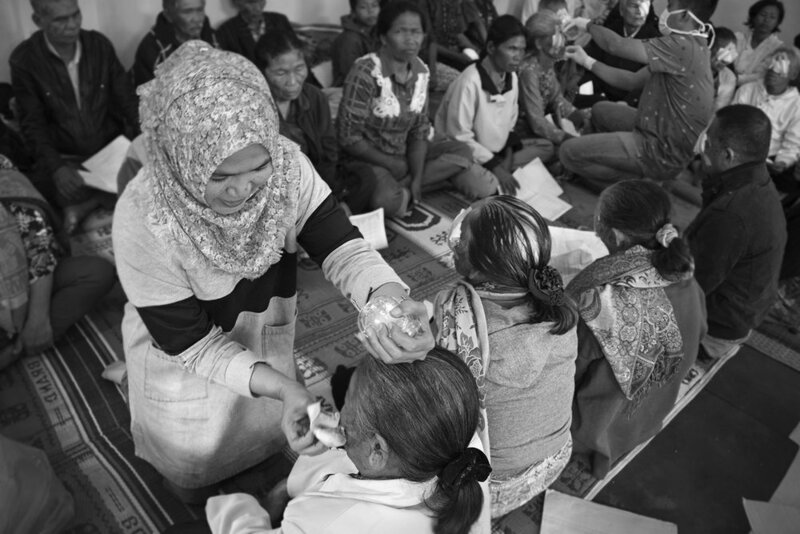 At Perdagangan Hospital in Simalungun, we completed surgeries on 269 eyes, at Porsea Hospital in Balige-Tobasa another 110 eyes, and at our final location in Sidikalang, 130 eyes. Our surgeons, Drs. Pinto Pulungan and Jusni Saragih, from Medan, are extremely professional and proficient, accomplishing these surgeries in just three long days. The tireless work of these doctors and their nursing staff is amazing to watch. On November 30th, on the eve of World AIDS Day, Caris employees presented to Bridge Academy students on a variety of subjects related to HIV/AIDS. The 40 students were 14 and 15 years old and enjoyed learning about World AIDS Day. After a brief introduction and discussion on HIV prevention and treatment, Caris representatives passed out a questionnaire on basic HIV/AIDS knowledge that children could fill out as a team. The team with the most correct answers received congratulatory chocolate. After discussing the questions as a class, Caris then presented a short film on the history of the virus, which included Haiti-relevant excerpts. Before the end of the session, the students submitted anonymous questions on small sheets of paper. Caris staff responded to these questions for the group, without any child feeling targeted or stigmatized because of his/her question. Caris has similar activities planned with three other local schools in Port-au-Prince during the week of December 1st. These sessions with Haitian teens will help increase communities’ understanding of the virus and will help eliminate myths about AIDS. On December 1st, Caris attended a commemorative event on World AIDS Day in Port-au-Prince. A number of NGOs and international donors attended, including UNAIDS, Haiti’s National Program against AIDS (PNLS), the Haitian Ministry of Public Health and Population (MSPP), the U.S. Embassy, and All In. The program included talks from representatives from the U.S. Embassy, UNAIDS, and MSPP. The Director General of MSPP stressed the importance of a holistic approach to combatting AIDS, involving educating communities and strengthening entire health systems. Several people living with HIV also provided testimonies about their experiences with stigmatization at school and in the work place. 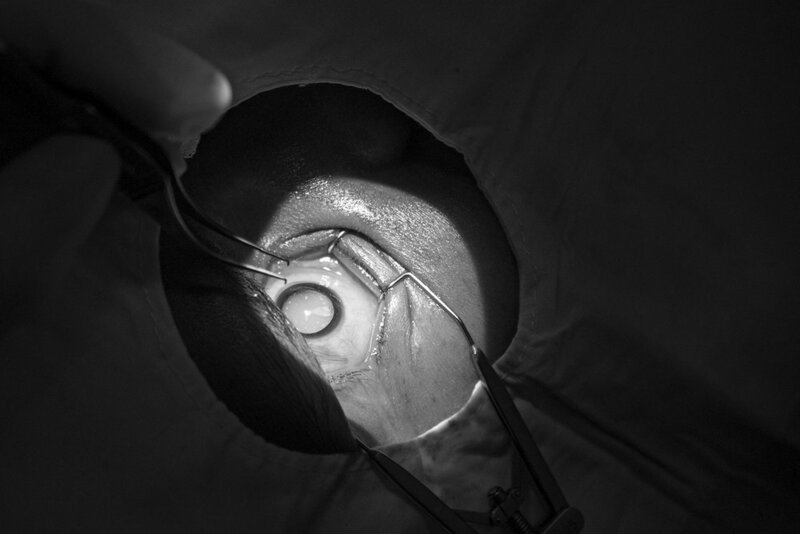 Over 70 major head and neck surgeries were performed by a team of 28 visiting medical personnel organized by Dr. James Netterville of Vanderbilt University Hospital. 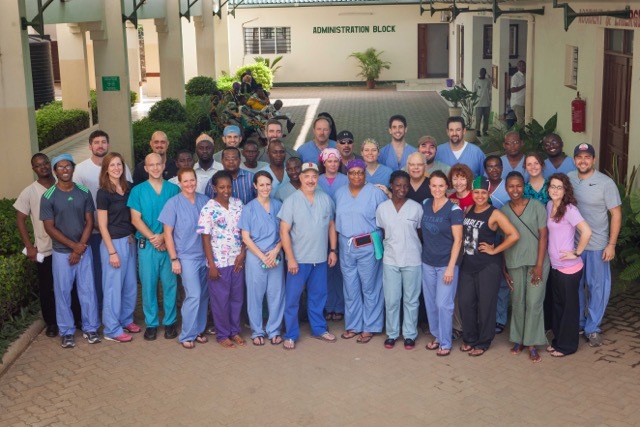 Nine doctors from Kenya, one each from Uganda, Ethiopia and Zambia screened patients and performed surgeries side by side with the American surgeons. At the same time over 200 patients were seen at the ENT clinic that ran simultaneously during the surgeries. CARIS sponsors the camp in partnership with Tawfiq Hospital and Mombassa Maize Millers. All surgeries are free and people who could never afford this medical care were helped. Patients come with huge tumors that have deformed their face and neck. They come covered in cloth from shame and fear. But after surgery and recovery they leave the hospital proudly exposed and full of hope. Hidden lives can now come out in the open. Delicate life changing surgeries were done on small children who had formed growths on sensitive facial nerves. These nerves were saved by the careful hands of our surgeons and the children will go on in life with normal control of their facial muscles. But the child who took all of our hearts was Hussan, a 14 year old boy. Back in February he and his brothers were shepherding their goats and sheep when they came across some wires that had been discarded by the local rock quarry. They took the wires home and were making their own little lights with flash light bulbs and batteries so they could study their homework. Unfortunately one of the wires still had the blasting cap connected. When they hooked the wires up to the battery the cap exploded near Hussan's mouth and blew off his chin. The poor boy only wanted to study for school and suddenly his life was drastically changed. He lost the greater percentage of his speech abilities and he had to be fed with a syringe. Without a chin his mouth gaps open and saliva is captured by a plastic bag he wears around his neck. His eyes looked hollow and hopeless. After 2 days of surgery our team had rebuilt his chin with a piece of the small bone in his leg and grafting his own muscles and skin round that bone. We hope to continue with more surgeries each year until his mouth is rebuilt. When he left the hospital he was eating his own food for the first time since the tragedy and his speech had improved. But most of all he had a glimmer of hope in his eyes and his mother and father were smiling. God's healing grace was felt and experienced. Caris Foundation International received an award from the USNS Comfort for outstanding community outreach at the third annual Fete des Enfants, or Caris Kids Day. Caris hosted this recreational event where volunteers served over 400 children in Port-au-Prince, Haiti. Other partners for the event included Union School Haiti and over twenty businesses and service organizations. As attendees arrived, the Navy Band from US Navy Ship (USNS) Comfort performed jazz and pop hits. The USNS Comfort is a part of the American naval fleet that provides free medical services to vulnerable populations. The day was filled with special events including sports, exercise and arts stations. JPerry, Haitian singer and songwriter, surprised attendees with a performance of “Dekole” and “Bouje,” his two most popular songs. “Fete des Enfants” began at 9:30 am, as buses from sites across Port-au-Prince arrived at Union School Haiti. The Navy Band from US Navy Ship (USNS) Comfort performed for the crowd in its final ‘Operation Continuing Promise” stop this year. Before beginning the day’s activities, Caris employees Odelyn Julot and Gislhaine Benoit led the group in the Haitian National Anthem. The children then formed teams and began rotations in sports and arts stations. US Navy volunteers led the soccer rotations, provided arts and crafts materials such as face masks, maracas and a large canvas for painting activities. Ayiti Yoga led yoga sessions, teaching them about healthy breathing and stretching techniques. Volunteers from the Red Cross and Union School ensured that activities ran smoothly and children moved from station to station in a timely manner. After morning rotations, the children gathered for a time of fellowship and lunch, catered by Marie Carmelle Valon. Lunch was followed by Zumba sessions, led by Zumbayiti, as well as cotton candy and fresco provided by Satigny. As everyone danced to the music, volunteers passed out balloons while singer JPerry surprised attendees with an energetic performance. As the day came to a close, everyone released their balloons into the sky, a symbolic show of unity. Each attendee then received a care package including food, toiletries, and toys, all generously donated by local businesses. After the event, the Caris Foundation received an award from the USNS Comfort for outstanding community outreach. Thank you so much to all of our sponsors for your generous donations and support for making this possible: Continuing Promise 2015, USNS Comfort, Union School, Croix-Rouge Haitienne, Brasserie Nationale D’Haiti, Societe de Production Industrielle et Alimentaire, Mirage Industries S.A., Maison Handal, Acra Distribution Company, Compas Market, Projet Alimentaire Mondial, Oriental Cosmetics S.A., SO.DIS.A S.A., Digicel, Olivier Dupoux, JPerry, L’etoile S.A., Muncheez, Satigny, Ayiti Yoga, Zumbayiti, Daupin S.A, and the Caris team. Thank you as well to the Red Cross for providing an on-call ambulance and for the Haitian Police for providing security for our event. We couldn’t have done it without you! 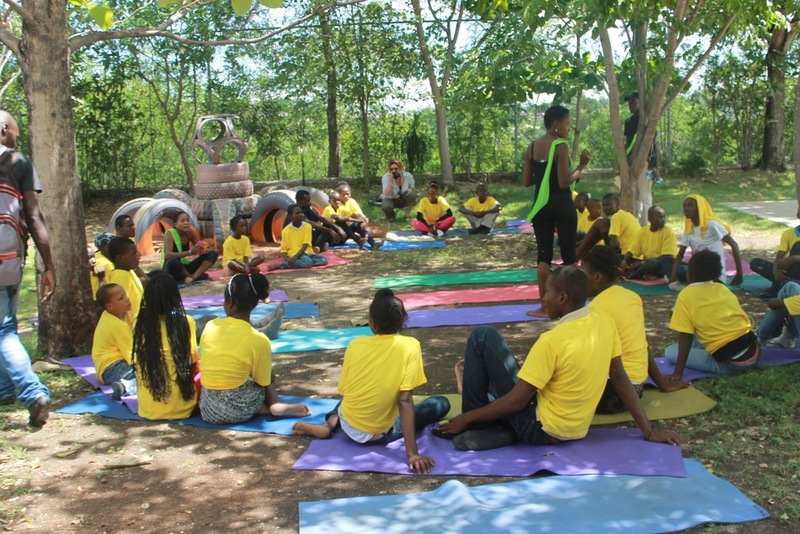 On Wednesday, Caris Foundation International Haiti had the honor to participate at a teacher training in collaboration with Zanmi Lasante, Partners In Health’s sister organization. The aim of the initiative is to facilitate access to health education in remote schools located across the Central Plateau region. Thirteen different modules on health and human rights topics were developed in Haitian Creole. The Caris team conducted a training session with 140 teachers from 41 schools supported by Zanmi Lasante, representing approximately 10,000 students. Following the training, teachers are expected to deliver the school-based curriculum to students 9 to 12 years old throughout the school year. During this period, the health messages will be monitored and evaluated to determine their effectiveness. We are excited about this collaboration and look forward to posting more updates as the school year progresses. Although it is typically seen as a day to raise awareness of HIV, there are many ways to do so and contribute to the fight against this disease. Let's remember and celebrate the lives of the 39 million people who have lost their lives to HIV/AIDS and not forget the relatives, friends and orphans who have been affected. Let's support those currently living with HIV by encouraging them to monitor their health status carefully, be adherent to antiretroviral therapy treatment (ART), consult with health practitioners regularly and to stay positive. Let's increase awareness of HIV prevention and treatment by educating and sharing the true facts to dispel myths to fight stigma and discrimination. Raising awareness can prevent new infections and encourage more people to get tested. Let's celebrate the progress we have witnessed over the past two decades. Let’s also resolve to work harder towards closing the gaps between the medical and public health fields to address the barriers that prevent access to care. We need to "step up the pace" for this one last mile. What does Caris Foundation do in relation to HIV/Aids? Caris Foundation International has been working in Haiti since 2008 to improve the care of HIV positive children, young people and pregnant women. 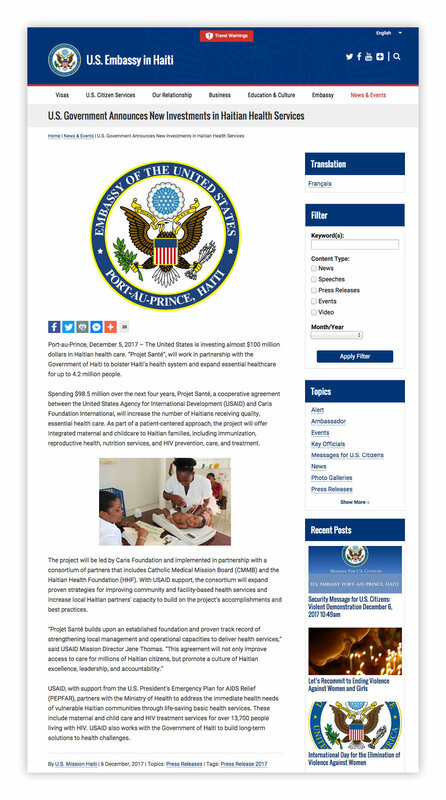 In partnership with the Haitian Ministry of Health (MSPP) and USAID/PEPFAR, Caris coordinates the Early Infant Diagnosis of HIV program in over 120 hospitals and clinics nationally. The program seeks to ensure that every child born to an HIV-positive mother is tested early. Where infants are diagnosed positive, we help initiate lifesaving Anti Retroviral (ARV) medication as soon as possible. Approximately 15,000 tests have been done since 2010, and 80% of the HIV-positive infants that have started ARV treatment are still alive. Caris had the honor to coordinate the first AIDS Walk in Haiti, in partnership with MSPP and the Haitian Red Cross. Over 300 participants marched through Port au Prince, chanting, distributing condoms, waiving awareness-promoting banners and posters. It was a huge success! Motorcycle taxi drivers were stopping by the parade of people to ask for condoms; construction workers were heard singing Creole HIV prevention songs that were being chanted through megaphones; teenage Red Cross volunteers were taking turns holding large banners and distributing red balloons to the crowd. Through the preparation for the walk we were able to reach the Haitian population with HIV public health messages through newspapers reports and national and international radio broadcasts. There is still a need to increase awareness, eliminate discrimination and to show support for people living with HIV through advocating for access to medication and treatment options. The Caris Foundation would like to thank those that help us every day in working to improve the lives of people affected and with HIV. Our thoughts and prayers are with the 34 million people world wide living with HIV, for those who have lost loved ones. We need to think more about those who are at risk of contracting the disease. Let our generation be the LAST to have to live with this pandemic and the ONE to eradicate it. There can be no real empowerment without character change and adjustments to one’s world view. If one approaches life through the lens of a fatalist then she is convinced that nothing can change so why try. It’s difficult to teach fiscal responsibility towards the future when fatalism is the prevailing attitude. Recently one of our field workers noticed one of our single moms singing and smiling and she asked why she was so happy “Because I have hope” was her answer. Three years ago these single mothers had no hope. They could not see any positive future. They had given up. This is an update of one of our single mothers in the Caris Empowerment Program in Kenya. Linet Kenga is a single mother of five and a member of the Maisha Mapya TTG in the village of Muyeye village. When she separated from her husband she was engaged as a cook in a private school. From her meagre savings she started an open air food business with a small capital of Ksh.250 ($2.50). This was a time she had been terminated from her job after she asked for a pay-raise. Her clientele grew steadily and soon she could not cope without a boost on her capital. She joined Maisha Mapya TTG just at the time when she needed more funds to boost her business and after two months she was one of the first loanees of Ksh.1,000 ($10.00) in August 2013. From that time she has taken seven loans, the most recent being Ksh.7,000 ($70.00) and her business is quite steady now. She has constructed a temporary shed which she uses as a cafe. Her capital base has grown from Ksh.250 ($2.50) to Ksh.10,000 ($100.00).